Near the confluence of the Marañon and Ucayalli Rivers we traveled by motorized skiff to a sheltered lagoon area to see giant water lilies. It was at times a rather hair-raising trip through thick water weeds that fouled up the motor of the skiff but the sight of the water lilies was worth it. At least it was for the passengers who sat and watched while the guides had to repeatedly climb out of the boat and get into the water to slash away weeds so the boat could move though the undergrowth and access the lagoon. These water lilies belong to the plant family Nymphaeaceae and the genus Victoria (named for Queen Victoria). 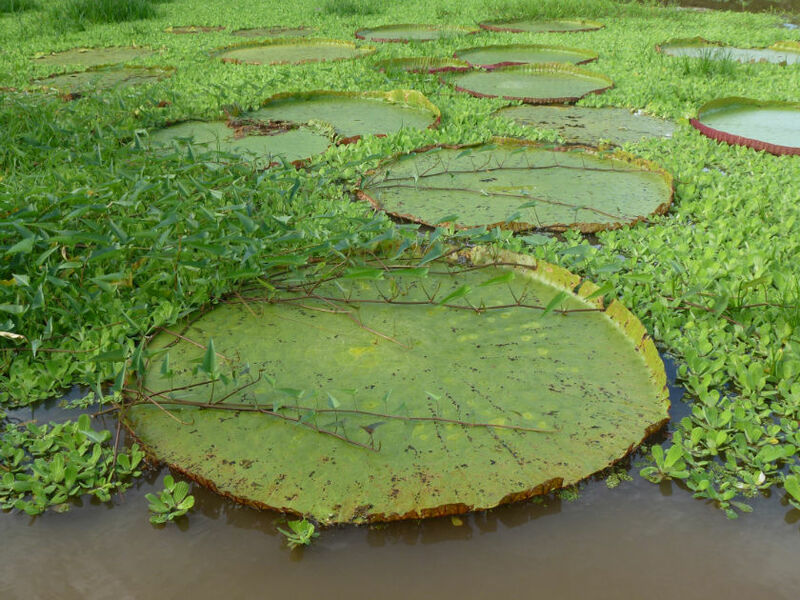 The genus has massive flat green leaves that form flat bowl-like structures on the water surface. It is the only known plant on this planet that has only one leaf. Our guide told us that there are only three known varieties of these water lilies and that they were originally from India. Victoria Amazonica, the species found in the shallow waters of the Amazon Basin has short-lived white flowers that turn pink after pollination. The single leaf can grow to almost 10 ft in diameter. Pollinated by beetles they take about 4 weeks to grow to this size. Strong ribs on the dark red underside provide support to the leaf which is said to be able to support tremendous weights. Although none of the lilies were in bloom, they were a spectacular sight to see out in the wild.